Cantley is a strange place. We came here on Historic Churches Bike Ride day 2007, and I had been looking forward to coming to Cantley for years, for a reason that I shall explain in a moment. People who have never visited Cantley may well have seen its most famous building, which, I must hasten to add, is not this church. The parish is one of those small ones which form a patchwork along the banks of the Rivers Yare, Bure and Waveney. They are ancient parishes, the first to be settled by incoming Angles and Saxons, the tiny manors surviving the Norman invasion and Domesday to form the tiny parishes of today. Many of the Yareside parishes have hardly any people in them - neighbouring Hassingham has just nine houses - and there are few proper village centres. 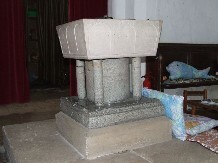 But Cantley is quite different to any of the others. This is an industrial parish, and the huge British Sugar processing plant can be seen from miles and miles away, all over south-east Norfolk. North of the riverside works, there are streets of houses which look as if they should be in Norwich or Ipswich rather than a remote country parish. You may wonder why the factory was built here, among these rolling fields and narrow lanes. Simply, we are halfway between Norwich and Yarmouth here, and the river is navigable by large boats. It was possible for the raw materials to arrive here by boat, rail or road, and for the refined sugar to leave by any of the same means. It was the perfect solution to the problem of getting east Norfolk and north Suffolk's sugar beet harvest in as quickly as possible. 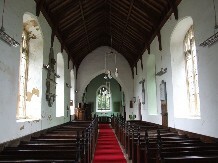 St Margaret is set at the northerm side of the village, among the modern houses. It is uncharacteristically long for a Yare Valley church, the stumpy, squared off tower accentuating this. 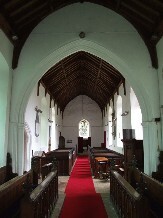 The long chancel stretches beyond a shallow transept, looking largely the result of its Victorian restoration. 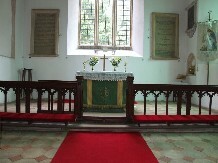 Inside, the church is light, pleasant and airy, feeling very suitable for Anglican congregational worship. The sanctuary is particularly pretty, being simple and neat, with a striking red carpet drawing the eye to the dark wood. 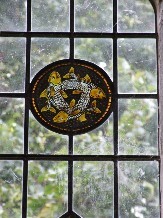 There is a good glass roundel of three fishes representing the Holy Trinity, but otherwise the windows are clear. 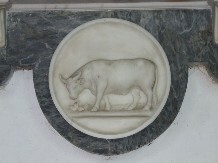 There are a couple of good memorials: Simon Kidby's has deliciously ornate writing, while another has a medallion of a bull at its base. 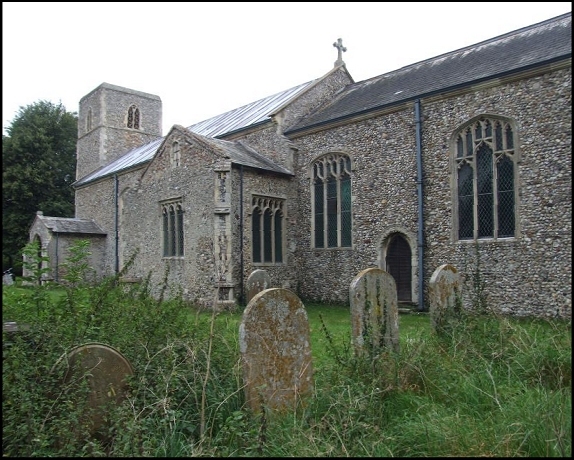 Cantley is not one of Norfolk's more famous or significant churches, and would be unlikely to end up in anyone's top hundred. 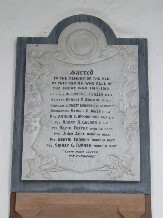 But it is an important place for me because it was here, in the 1930s, that my grandfather first settled in East Anglia. 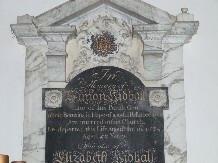 During those dark, difficult days, he had left Kent looking for work, building roads for a while in Yorkshire, and then coming here to help build the new British Sugar plant. He also worked in Ipswich for a while, and then settled in Ely, where he met and married my grandmother, and worked for British Sugar until he retired in the 1970s. Cantley was a place that he had often mentioned, and I had always wondered what it would be like. I do not know if he ever actually lived in Cantley. It is just as likely, I suppose, that he rented a room in some Norwich or Yarmouth slum, taking the train or even cycling to work each day. I think it extremely unlikely that he ever visited this church. And yet, as I pottered around the graveyard taking photographs, I sensed his ghost, if only for a moment, hovering behind me. It was because of his journey here that I am proud to call myself an East Anglian.